I know, two posts in three days. Crazy. Really, I’m here because I noticed that Sunday’s post didn’t get fed into Facebook. And then when I tried the usual trick of unsubscribing my blog in Notes and resubscribing, it claimed that the URL is not a valid feed (wrong!). So I enabled a WordPress app that allegedly publicizes my blog posts to Facebook. So here we are. I wouldn’t want you all to miss my very important and valuable pictures of knitted goods, now would I? Let me know if you don’t get this. I know, I know. Let’s just chalk it up to life and move on. So, how you been? I’ve been busy. It’s funny, when you go this long between posts, it becomes hard to choose what to write about. So, a summary (I know, that’s all I do anymore). Zebula turned 8 – there was a party. 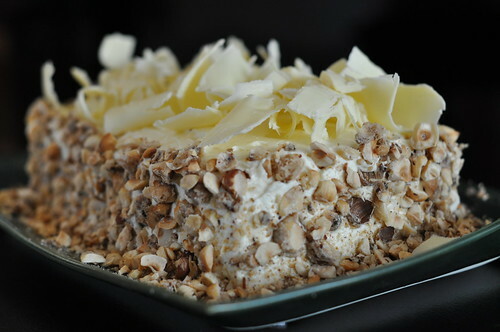 And cake. And a magician. The cake was nondescript, but yummy. No photos. (Horrid, horrid Bernat loopy acrylic) It reminds me strangely of the CBC’s exploding pizza logo. I think it’d be kinda neat to do this one in oranges and blue. And wool. 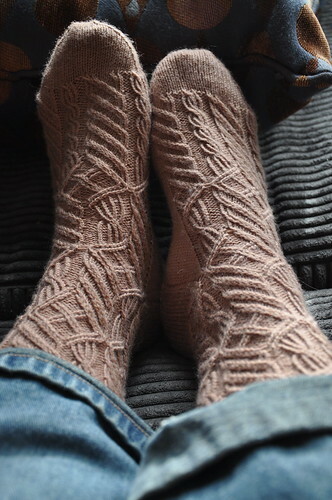 (Elann sock yarn) They’re my new favourites – I might make them in not-beige sometime. 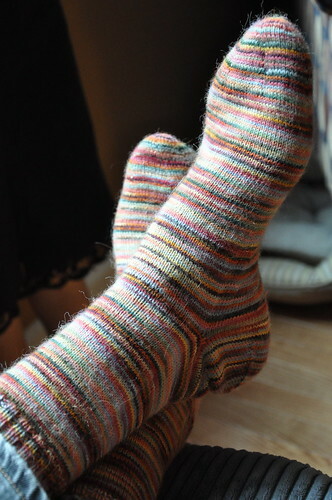 I finished a giant pair of socks for Dr. Thingo using Cat Bordhi’s Footprints method. (Bernat acrylic somethingorother) It was the nail in the coffin. I made this one in 5 days. 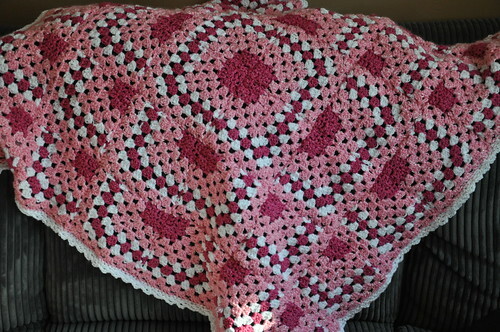 And when I realized how little they’d be paying me for it, and how much I disliked the yarn and how busy I am with things I actually want to make with yarn I like, and wondering why a design house needs to constantly be churning out the same giant granny square afghan over and over again, I decided enough was enough. I have retired as a homeworker. It was fun for five years, but I need to move on. There was Thanksgiving. I made a chicken. (Koigu PPPM – always lovely to work with). That’s (in order) a hat an mitten set for Zebula (from the Koigu roving I spun); a hat and mitten set for Vorlon (from some Lamb’s Pride that’s been sitting in my stash since I made Eric a Dr. Who scarf over a decade ago); a Valentine Sequin Scarf I finally finished that I should have given S in August as a thank you for babysitting my kids last year (Tilli Thomas Rock Star -it’s silk, with beads pre-strung. Gorgeous! I ended up having to order a new skein from the store I bought it from in Ottawa because I ran out); a Norwegian Sweet Baby Cap for wee baby F (some sock yarn from the pile. 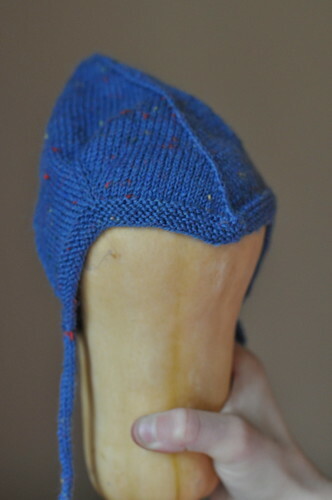 Yes, that’s a butternut squash); and a pair of mittens for me (also mystery yarn from the pile. Sorry, crappy picture I took in my kitchen just now). 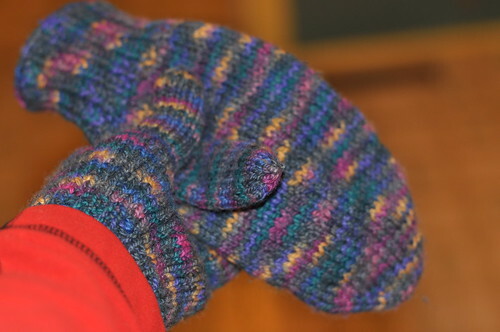 I made an Aviatrix had and mittens for ecomonkey (Mystery stash yarn. No picture. Don’t know why). Vorlon wanted to be Batman, which shocked me because Batman doesn’t figure anywhere in any of the Star Wars movies, which have been his obsession for the past three months. 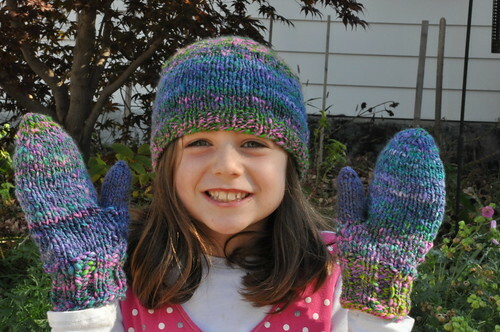 The pattern is McCall 4951. 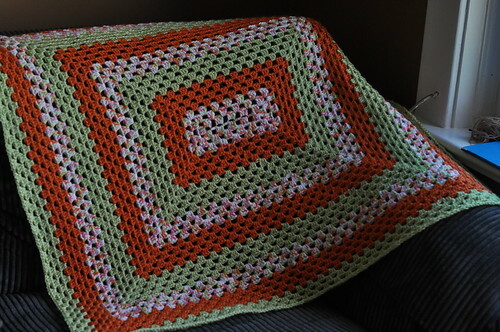 It was fun to make, but fiddly – there were about 46241 pieces to sew together. But he loved it. And those little ears on the hood kill me! So cute! 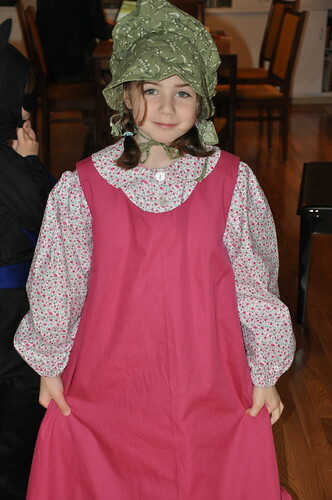 Zebula wanted to be Laura Ingalls. I’d made the bonnet ages ago. I sewed up the dress (McCall 9424) and pinafore in about two days. And I finally scrounged up the courage and made buttonholes. Buttonholes! If I’d known they were that easy, I wouldn’t have avoided them for this long! The dress has become Zebula’s favourite nightgown, which is kind of unfortunate, because, thinking it was just going to be a costume, and being in a hurry to get it done, I kind of cut corners on a lot of details, so I’m not sure how it’s going to hold up. 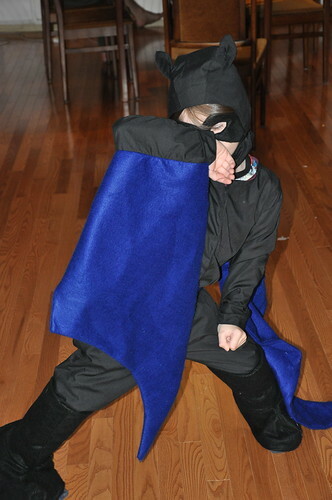 I even had a costume for Hallowe’en! Ok, it was just a wig, but it was enough that I felt like I could attend the party this year without shame. Turns out, I don’t make a good blonde. But K, who was dressed as Thrace from Battlestar Galactica (her partner G was Sam. Frakkin’ awesome!) decided that I looked like Hot Cylon Chick (Six!) from same series, which I took as a compliment. I made, on commission, a knockoff of a Hicky Hider, by Lululemon. 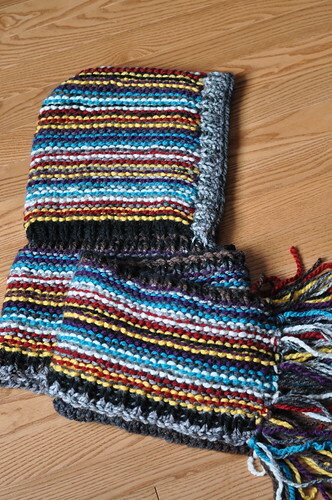 I think I did ok. It’s Micheal’s store brand bulky yarn. It’s super-light, and very fluffy. I hope it works – I haven’t sent it off yet to its intended recipient, so I don’t know. I had a birthday (38!). On that day, I slipped on some ice and fell, and tore something in my left knee. Physiotherapy is helping, and I feel like a total doofus. I didn’t make myself a cake this year (a friend made me a Guinness cake, which was delicious, and a wonderful cake fairy (K, who was Thrace at Hallowe’en, as mentioned above) left some cake on my doorstep, which was wonderful. Also, ecogrrl took my kids for the afternoon and they all made me and Dr. Thingo dinner, which was also wonderful. What else? 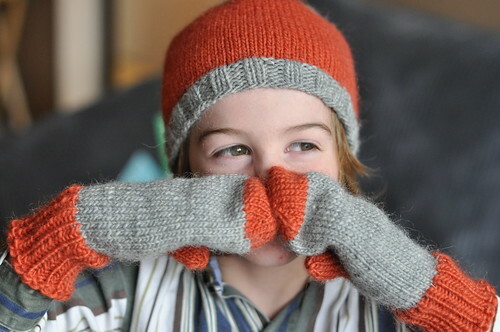 Working on more socks from Sock Innovation (I think I’ll have four pairs left to make after this one). 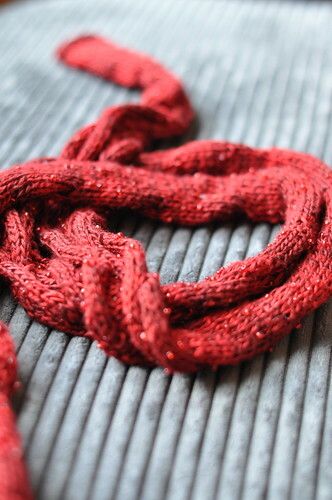 Almost done with Clevermonkey’s aran sweater. I’d be done, only the sleeve caps in the pattern totally didn’t work in the armholes, so I reknit them. However, since I busted up my knee, squatting is painful, so I haven’t blocked them yet. But I will! Soon! Sorry, Clevermonkey! I also finished a Phildar cardigan for Zebula (needs a button. And pictures.) And I’m this close to being done a pair of longies for ecomonkey. And I also unraveled a bunch of partially knitted stuff that just wasn’t working. On the choir front, the Grand Philharmonic Choir has a new director, who has done nothing but impress me with his knowledge, musicianship, professionalism and quiet sense of humour since he started. It’s been an excellent four months of rehearsing and performing so far. We did a fantastic performance of Messiah yesterday. I love being part of this choir more than ever! Saw Battlestar Galactica all the way to the end, which left me feeling betrayed. Worst last season of a show, ever. Haven’t read nearly enough of anything, but am currently reading Notre Dame de Paris, by Victor Hugo, and enjoying it a lot. Getting ready for the holidays. Not by having finished my shopping, mind you. I’m way behind on that. But getting ready for baking, and heading over to Ottawa where my lovely brother and his lovely wife are going to host about a gazillion people for Christmas dinner. Brave souls! I’m looking forward to being with the gang this year. I hope you had a good fall too! Happy holidays!